Web Reports Builder offers a large selection of highly customizable, professionaly looking reports that take just a few minutes to build. You can build the reports for your audience or let your users create their own by simply choosing the data sources, columns, groups and sort criteria. Web Reports Builder offers a broad range of output options such as MS Word and MS Excel. You can reuse the security settings you've established in the program to define the user permissions and choose which data sources to expose. It is very helpful in larger organizations where departments create their own reports based on the data sources provided by the IT team. Each web report or chart can be defined as public or private where you can further set the permissions to configure who gets the read and write access. Data Encryption allows you to encrypt important data in the database such as credit card number or Social Security number. It ensures sensitive information stays safe and reaches only those users who need it. 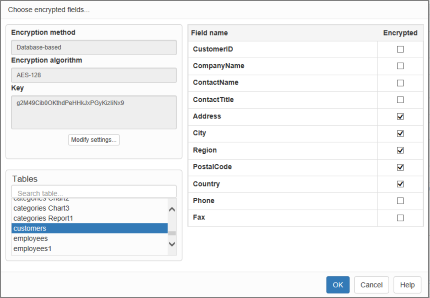 You can select database-based or code-based encryption method, choose fields to be encrypted and enter encryption key. Active Directory authentication allows users to log in to the generated by PHPRunner/ASPRunnerPro applications using their accounts in an Active Directory domain. Login automatically feature allows person that is already logged into Windows to be automatically logged into the generated application. 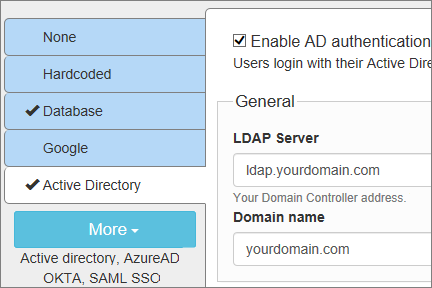 You can use Permissions feature along with Active Directory authentication.